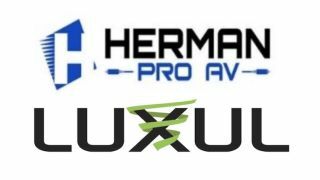 Luxul has entered into a distribution agreement with Herman Pro AV to allow the manufacturer to expand its presence in the commercial AV space with its AV-over-IP switches, while strengthening product access and dealer support across the United States. Herman Pro AV will distribute Luxul's entire lineup of routers, wireless controllers, and access points, switches, intelligent network power distribution units (PDUs), and accessories. "By partnering with Herman, our dealers not only have greater access than ever to our networking solutions but also a range of unique value-added services, such as inventory and logistics management," said Kevin Hansen, vice president of sales at Luxul. "This partnership is a key step in expanding our reach in the commercial market, while delivering the highest levels of support for our customers." "We are very excited to partner with Luxul," said Jeffrey Wolf, executive vice president at Herman Pro AV. "The company's product lineup is an important, strategic addition to our offering, whether it's routers with Domotz remote management technology or intelligent PDUs. The result is added value for our partners and better networks for their customers." As a network manufacturer, Luxul plays an increasingly significant role in AV-over-IP distribution. With the rise in popularity of these solutions, the network switch becomes the matrix and a critical component in commercial AV applications. Luxul's family of L2/L3 managed switches features devices in a variety of configurations, optimized for HD-over-IP applications. Switches include the 26-port Gigabit AMS-2600; 26-port/24 PoE+ stackable AMS-4424P; 52-port Gigabit PoE+ XMS-5248P; and the 52-port stackable Gigabit PoE+ XMS-7048P. Providing integration with AV rack systems, the AMS-2600 and AMS-4424P both feature rear-panel ports and front-facing LEDs. For network expansion, the stackable AMS-4424P and XMS-7048P each offer two 10 Gigabit SFP+ ports for seamless scalability and management of up to 16 switches, for a total of 384 ports and 800 ports, respectively. In addition, the AMS-2600 includes two Gigabit RJ-45/SFP combo ports, while the XMS-5248P features two Gigabit SFP ports.